I began sewing at a very young age. 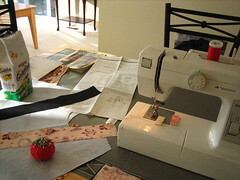 At five or six, I was hand stitching with needle and thread. 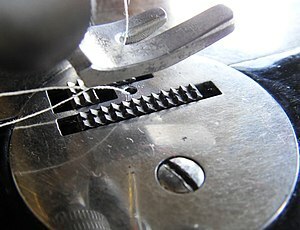 Now and then, Mom would let me press the foot pedal of the sewing machine while she guided the fabric up top, keeping my hands far from the way of the fast-moving needle. I think I was nine when Mom let me take sewing as a 4-H project. At last, I would get to sit in the sewing chair and manage not just the foot pedal but needle, presser foot, feed dogs, tension, bobbin, spool and flywheel. Beyond learning the machine itself, my focus that year was to make straight lines of even, straight stitches. Turning corners? Yes. Rounding curves? No. Varying stitch length? Within reason. Decorative stitching? No way. (However, when Mom wasn’t looking, I would tinker with zigzag on fabric scraps I rescued from the wastebasket, then stuff them in my pocket and carefully restore the sewing machine settings, hiding all evidence of my wayward behavior). No doubt my family reveled in an abundance of pillowcases and beanbags. I’m sure my skinny waist, stick legs and bony ankles looked marvelous in the red, cotton, elastic waist skirt I made for the fair that summer. Actually, no one probably noticed the skirt, so smitten they would have been by the Wonder Bread polka dotted kerchief I created to hold back my hair – not to mention the matching drawstring bag swinging from my wrist. This ensemble was not then and never will be fashionable. But I made it myself, by golly. Straight lines grew dull. Even with a variety of threads and fabrics in different colors, textures and weights, I was anxious to steer around curves with that machine. Finally, the next year, Mom told me to thread the machine with a white spool and white bobbin. She pulled a rectangle of navy fabric out of the scrap stash and drew on it with dressmaker’s chalk: a large S curve. She handed me the swatch and instructed me to lower the needle into one end of the chalk line, then follow the curve – slowly – trying to keep the stitching precisely on the line. I took a deep breath and positioned the fabric under the presser foot, then guided the needle down into the very spot where the curve ran out of chalk. Mom leaned over my shoulder while I reached around to lower the lever that snapped the presser foot down into position to hold the fabric securely against the feed dogs. I cranked the flywheel a couple of times, just to get started, then gently laid my right foot into the pedal on the floor. The machine hummed, the needle lifted, and Mom and I leaned in to see more closely. Neither of us breathed. Despite my love for speed, I ran the entire course of that chalk line at a cautious pace. When I reached the end, I turned my head to the right, where Mom’s face was just a 5/8” seam allowance from my own. Did I need to backstitch? Not this time, she said. That’s only if you need to protect the seam from coming loose. This was just practice. So I raised the needle, lifted the foot, tugged gently on the swatch and snipped the two threads, leaving a few inches of tail both on the work and on the machine. Even as a beginner, I knew the frustration of having your top thread zip up through the eye of the needle, just as you were about to begin stitching. A generous tail avoids that inconvenience. I turned sideways in my chair, toward Mom, and together we lifted the fabric close to our eyes. Mom pulled the shade of the swing-arm floor lamp closer, pooling the light around the work. She pushed her glasses up her short nose and looked down through the bifocals to magnify the tiny stitches. I looked at her, waiting for assessment. She looked at me, making no comment. I looked back down at the S curve. The stitching covered nearly all of the chalk. There were a few places where the white thread veered off course and left the chalk untouched. Not many, but a few. I think I did pretty well, I said. But I need more practice. The corners of her mouth curved upward. Right answer. I’m sure I spent the better part of that afternoon drawing curvy chalk lines and trying to cover them with stitching. Ultimately, I found that a bit more speed helped me stay on track. And so did not looking at the point where the needle was puncturing the fabric, but a bit ahead, so I could anticipate and be ready to move with the curve. It was like a game of skill, and I got really good at it. At that stage in my sewing education, I could not possibly appreciate how important curves would be in construction of a garment.